The answer to your dinnertime dilemma. Family-friendly soups to satisfy your soul—and stomach. To close the coldest, bone-chilling day or soothe the roughest afternoon, turn to Soup & Comfort for hearty classics, international favorites, and inventive updates. Packed with pages of nourishing, emotionally satisfying soups and stews using affordable, fresh, easy-to-find ingredients (No bouillon cubes here! 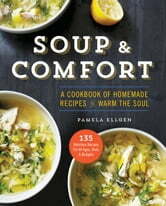 ), every recipe in this soup cookbook caters to a wide variety of dietary preferences and tastes, from tantalizing vegetarian versions to gluten-free options. From chilled soups to chowders, Soup & Comfort offers something for everyone to enjoy—one spoonful at a time.